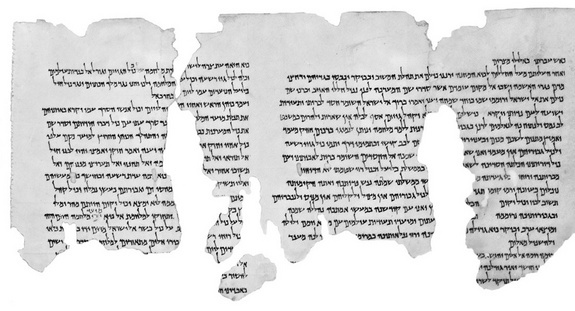 Scholars are divided about who authored the Dead Sea Scrolls and how the texts got to Qumran. Some argue that the scrolls were written at the site itself while others say they were written in Jerusalem or elsewhere in Israel. Qumran itself was first excavated by Roland de Vaux in the 1950s. He came to the conclusion that the site was inhabited by a religious sect called the Essenes who wrote the scrolls and stored them in caves. Among the finds he made were water pools, which he believed were used for ritual bathing, and multiple inkwells found in a room that became known as the "scriptorium." Based on his excavations, scholars have estimated the population of the site at as high as 200. More recent archaeological work, conducted by Yitzhak Magen and Yuval Peleg of the Israel Antiquities Authority, suggests that the site could not have supported more than a few dozen people and had nothing to do with the scrolls themselves. They believe that the scrolls were deposited in the caves by refugees fleeing the Roman army after Jerusalem was conquered in A.D. 70. Magen and Peleg found that the site came into existence around 100 B.C. as a military outpost used by the Hasmoneans, a Jewish kingdom that flourished in the area. After the Romans took over Judaea in 63 B.C. the site was abandoned and eventually was taken over by civilians who used it for pottery production. They found that the pools de Vaux discovered include a fine layer of potters' clay. There are other ideas as well. Cargill argues that while Qumran started out as a fort it was later occupied by a sectarian group whose members were deeply concerned with ritual purity. "Whether or not they are the Essenes, that's a different question," he said. This group, much smaller than earlier estimates of 200 people, would have written some of the scrolls, while collecting others, he argues. Other groups, not part of the Qumran community, may also have been putting scrolls into the caves, Cargill said. Can clothing solve the mystery? The new clothing research may help to identify the writers of the Dead Sea Scrolls. Shamir told LiveScience that it is unlikely the scrolls were deposited in the caves by Roman refugees. If that were the case, the more-popular textile in ancient Israel, wool, would have been found in the caves along with other garments. "If people run away from Jerusalem they would take all sorts of textiles with them, not only linen textiles," she said. "The people who ran away to the Cave of Letters, they took wool textiles with them." Peleg, the archaeologist who co-led the recent archaeological work at Qumran, told LiveScience he disagrees with that assessment. He said he stands by the idea that there is no connection between Qumran and the scrolls stored in the caves. "We must remember that almost all the textiles were found in the caves andnot at the site. The main question is the connection between the site and the scrolls," Peleg wrote in an email. "I can find alternative explanations for the fact that scrolls were found with linen." For instance, linen could have been chosen as scroll wrapping for religious reasons or perhaps priests were responsible for storing the scrolls and they wore linen clothing. "The clothes of the priests were made from linen," Peleg wrote. Josephusalso wrote that the Essenes were very frugal when it came to clothing and shared goods with each other. "In their dress and deportment they resemble children under rigorous discipline. They do not change their garments or shoes until they are torn to shreds or worn threadbare with age. There is no buying or selling among themselves, but each gives what he has to any in need and receives from him in exchange something useful to himself ..."
In their paper, Shamir and Sukenikalso point to another ancient writer, Philo of Alexandria, who wrote that the Essenes wore a common style of simple dress. "And not only is their table in common but their clothes also. For in winter they have a stock of stout coats ready and in summer cheap vests, so that he who wishes may easily take any garment he likes, since what one has is held to belong to all and conversely what all have one has." Cargill said that the clothing is further evidence that there was a Jewish sectarian group living at Qumran. "You do have evidence of a group that raised its own animals, pressed its own date honey, that appears to have worn distinctive clothes and made its own pottery, and followed its own calendar, at least a calendar different from the temple priesthood," he said. "Those are all signs of a sectarian group." He also noted the presence of mikveh (ritual baths) at the site and the fact that the residents could make pottery that was ritually pure. This group appears to have wanted to separate itself from the priests based at the temple in Jerusalem. "There is a congruency within many of the sectarian documents that appears to be consistent with a sectarian group that has separated itself from the temple priesthood in Jerusalem," Cargill said. According to Cargill's theory, the people of Qumran would have written some of the scrolls, while collecting others. "Obviously they didn't write all of the scrolls," Cargill said. Dating indicates some of the scrolls were written before Qumran even existed. One unusual scroll, made of copper, may have been deposited after Qumran was abandoned in A.D. 70. Cargill says it's possible that some of the scrolls may have been put in caves from people outside the community. If that's true, some of the textiles could also be from people outside of Qumran. 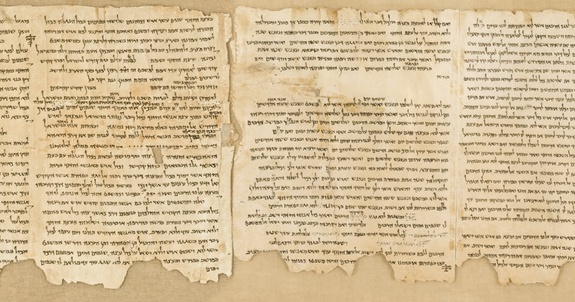 "[If] not all of the Dead Sea Scrolls are the responsibility of sectarians at Qumran then it would follow that not all of the textiles that are discovered in the caves are [the] product of a sect at Qumran," Cargill said. Were there women at Qumran? The new research may alsoshed light on who created the textiles. The textiles are of high quality and, based on the archaeological finds at Qumran itself, where there is little evidence of spindle whorls or loom weights, the team thinks it's unlikely they would have been made at the site. "This is very, very important, because this is connected to gender," Shamir said, "spinning is connected with women." She explained that the textiles were likely created at another site in Israel, with women playing a key role in their production. This suggests that there were few women living at Qumran itself. "Weaving is connected with men and women, but spinning was only a production of women, [and] we don't find this item at Qumran."